As of writing this weather post, Philippine Atmospheric Geophysical and Astronomical Services Administration (PAGASA) reported that the rain showers and thunderstorms may dominate Luzon and Mindanao region. PAGASA weather forecasters said Saturday afternoon, "Flash floods and landslides threaten the eastern parts of Luzon in the next 24 hours." PAGASA said in its 5 p.m bulletin, "Luzon and Mindanao will experience mostly cloudy skies with scattered rain showers and thunderstorms becoming cloudy with widespread rain over the eastern section of Luzon which may trigger flash floods and landslides." Meanwhile, Gale Warning No. 3 forecast: "Moderate to strong winds blowing from the northeast will prevail over Luzon and its coastal waters will be moderate to rough. 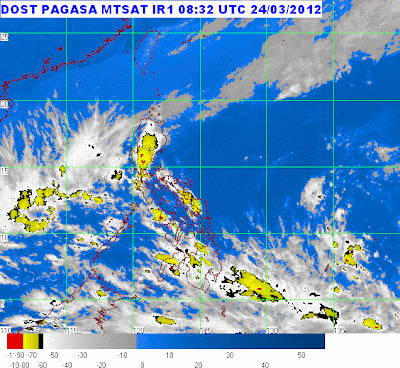 Elsewhere, winds will be light to moderate coming from the east to northeast with slight to moderate seas." Comments or suggestions about "PAGASA: Rainy summer continues into weekend" is important to us, you may share it by using the comment box below.